A couple of weeks ago I dropped by my local Goodwill Store. Since it's conveniently located next to a grocery store I frequent, I end up making a little detour once in a while. It's a small, dingy, and to be quite honest depressing little shop. Nevertheless, I always open my mind to the possibilities and psych myself up for the thrill of the hunt. It is really like a treasure hunt. You need to look beyond the gritty displays and objects hidden beneath layers and layers of dirt. More often than not I leave empty handed. But on that day, I hit a gold mine. I scored 10 lovely pieces - get this- for $25! Three solid brass candlesticks, four milk glass vases, one silver tray, a glass and brass votive bowl, and a golden brass compote. I was beyond thrilled! Needless to say, they did not look like that picture above - it took me almost an hour to polish all the brass and silver pieces and wash my new vases. Without a doubt, my favorite pieces from this wonderful find are these gorgeous vintage milk glass vases! They were less than $2 each! I started my milk glass collection last year, and this will make a great addition. I adore their modern quality and the fact that they are such versatile accessories. The silver tray was $1. How can you go wrong with that? The brass pieces were so dull and dirty, my hands were sore after polishing them. It was worth it. They look amazing! 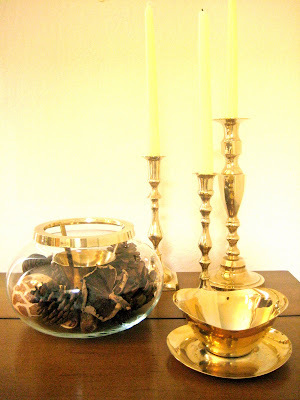 The glass and brass bowl holds a votive candle, and I filled it with some of my WSH Safari potpourri. It will be fun to find different ways of dressing it up. 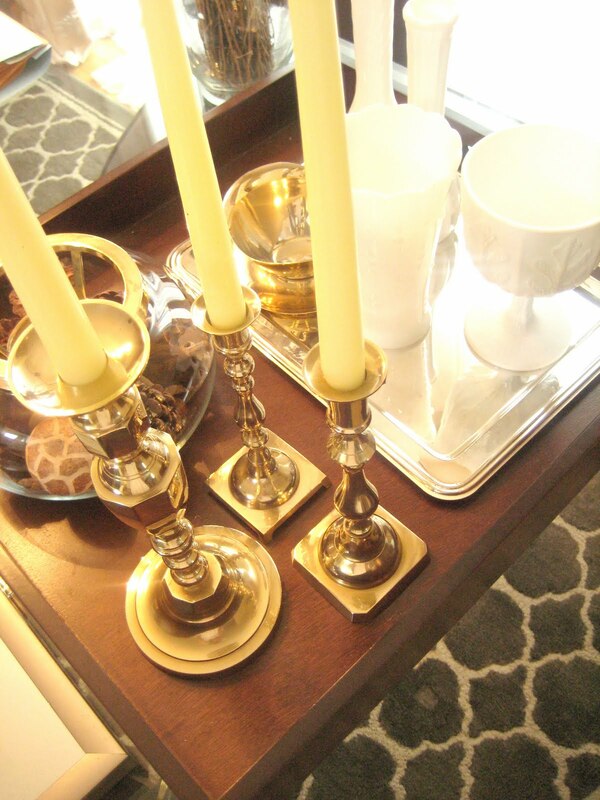 The brass candlesticks (taper candles not included), are just classic home accents that work well in any style of room. 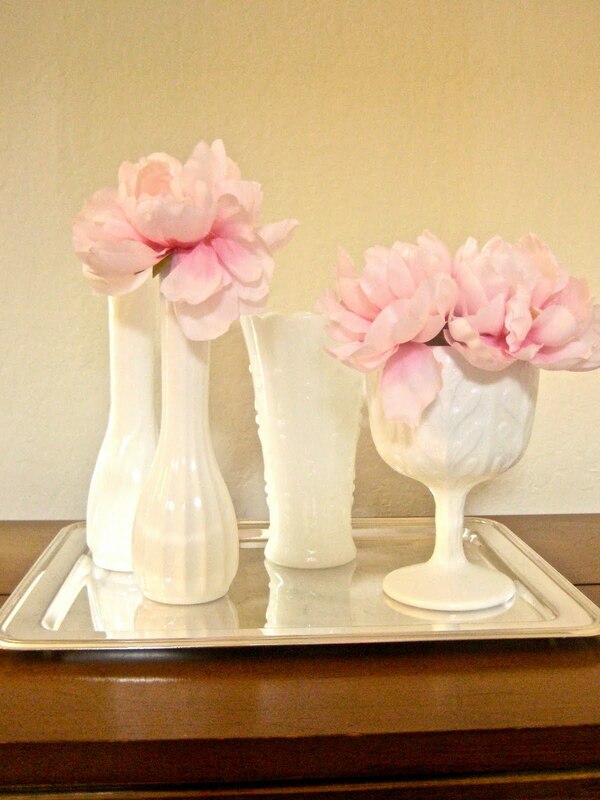 The compote will work perfectly as a jewelry catch-all or small vase. 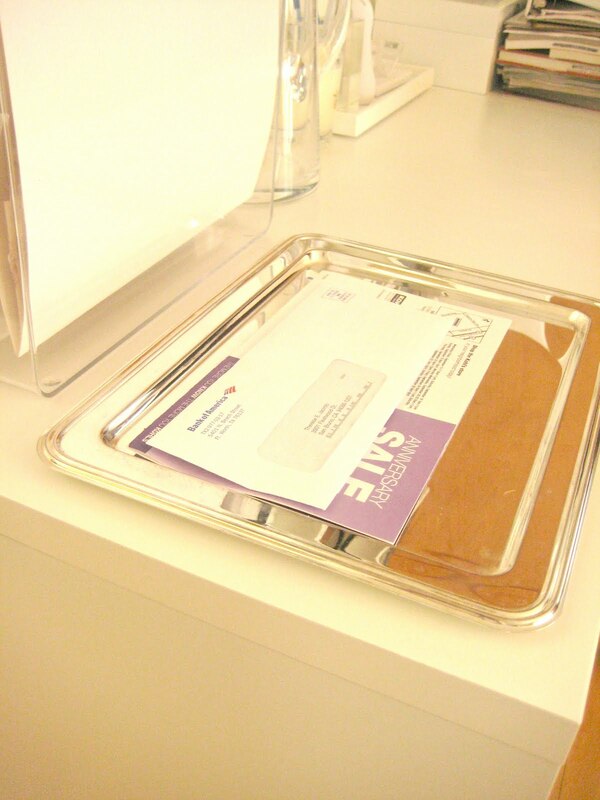 The silver tray looks great on my desk as a mail catch-all!